THE fastest and all the luxury services between Dover and Calais run by day. This has given rise to the development of a special ship type - the day service cross-Channel vessel - which is designed to carry a large number of passengers in seats and on decks and in private cabins, to feed them and at the same time to carry a few motor-cars and mails. The vessel above is the “Canterbury”, a Southern Railway ship of 2,910 tons gross. She was one of the first of a new type of day service ship and embodied at the time of her completion many innovations in arrangement. Completed at Dumbarton in 1929, she has a length of 329 ft 7-in between perpendiculars, a beam of 47 ft 1-in and a depth of 16 ft 10-in. 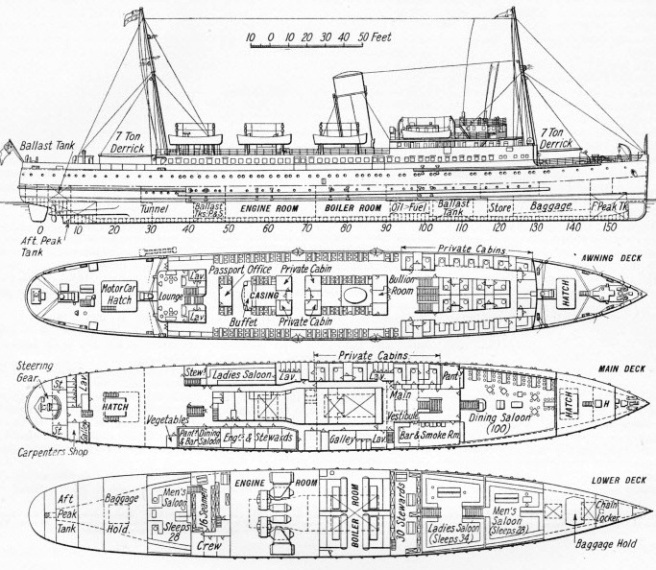 As the drawing shows, the majority of the decks are occupied by passenger quarters, and the geared turbines and water tube boilers also take up much room beneath the main deck. The “Canterbury” was built to meet the full requirements of the Board of Trade for cross-Channel service, and she is certified for carrying about 1,700 passengers, although it is not usual for anything near that number to be carried. The special service has a demand of about 250 to 300 passengers. The hull of the “Canterbury” is subdivided by twelve transverse watertight bulkheads, and all the doors in these bulkheads are operated by Brunton’s hydraulic door gear controlled from the bridge. The ship has an attractive appearance with her straight stem and cruiser stern. Four geared turbines drive her twin shafts through single reduction gearing, and these take steam from four water-tube boilers arranged immediately forward of the engine-room. They exhaust into the single raked funnel.